Shirts With Random Triangles: Reports: Greg Schiano To Become New Ohio State Defensive Coordinator. Reports: Greg Schiano To Become New Ohio State Defensive Coordinator. Greg Schiano. Image via The Columbus Dispatch/AP. Reports out of Columbus say that former Rutgers and Tampa Bay Buccaneers head coach Greg Schiano will be replacing Chris Ash as Ohio State's defensive coordinator. In a rather odd case of college football karma, Ash is leaving Ohio St. to become head coach of Temple. 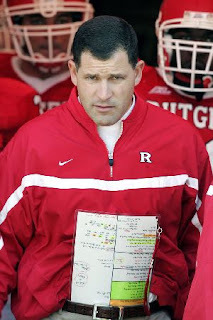 Schiano was head coach of Rutgers from 2001-2011. In his decade as head coach, Schiano led the Scarlet Knights to a 68-67 record, with five bowl games. He left Rutgers to become head coach of Tampa Bay in the NFL. The Buccaneers fired him in 2013.